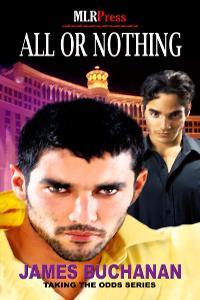 Blundering his way forward in his relationship with Nevada Agent Nick O'Malley, Riverside Detective Brandon Carr brings his daughter, Shayna, to Las Vegas to meet Nick. Nick has his own reasons for pushing Brandon toward a deeper commitment. But when the unthinkable happens, what every cop knows ends in tragedy, can Brandon hold it together long enough to solve the crime? As Brandon spirals into the hell of being a cop and a distraught parent will his love of Nick, and Nick's love for him, be enough to see them through? It's all or nothing and they can't afford to lose.